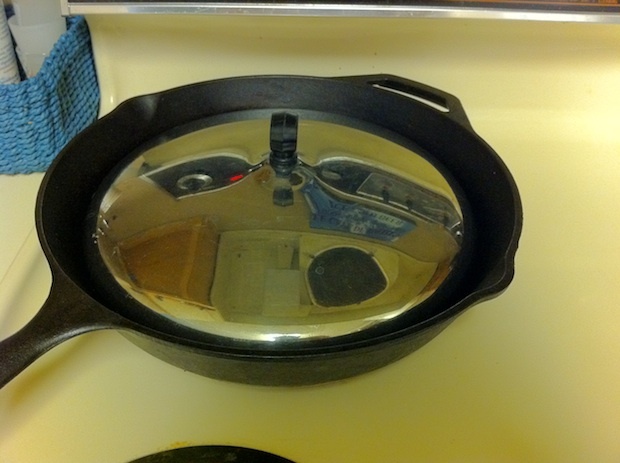 Home-cooked steaks will never be the same and one pot meals just became that much easier. 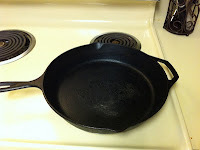 The cast iron skillet revolutionized both (and all the while became an effective burglar deterrent - the sucker's heavy). If you looked online, there are hundreds of posts raving about these 5lb pieces of wonder. 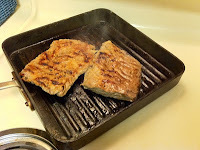 For me, since I rarely have access to a grill, they are excellent for cooking, in a matter of minutes, a beyond restaurant-quality steak. Some of the best steaks you'll taste are grass-fed steaks straight from your cast-iron skillet - hands down. 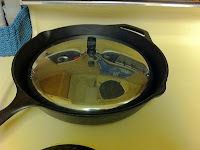 I use an old school, steel lid as a make shift lid for the skillet. Nowadays I can only find the glass lids, so you may have to try a thrift store. This one has about an inch and half depth to it so its perfect for warding off smoke detectors and locking in that perfect 8-minute ribeye. My half Italian side may kill me in my sleep. It's been decided - my homemade pasta making skills need A LOT of work. Flour everywhere. Bits of pasta littered in the carpet. And boxes of dried Barillo laughing at me in the pantry. Now, I understand the basics. Make the dough. Roll the dough. Set up pasta roller. Roll the dough again. Adjust setting. Roll. Setting. Roll. Setting. Roll. Hang it on a clothes drying rack. Boil quickly. Enjoy. ...But it seems to always end up mushy. And as I watched my ravolis (which were no where near the standard half dollar size) slowly come apart in the boiling water, I realized I may have been a little too aggressive on doing stuffed pasta. However, it was a great third attempt. And more attempts will follow in the coming years (Years, not days). From what I've learned, it just takes patience and repetition. The ingredients are basic and its a great "together" activity on a lazy Saturday or Sunday. You'll need a pasta roller (and hopefully one that has a clamp that fits on a kitchen counter and not just on a dining room table) and a few simple ingredients (flour, salt, olive oil, eggs). Most women probably haven't rolled pasta. So don't take yourself too seriously (they'll probably be at least one flour fight). Take turns rolling or guiding the dough into the roller. It most likely won't turn out perfect, but its pretty cool to look around and see sheets of pasta hanging from all places in your house. They'll be that anticipation and excitement of something new. Have a drink, let it dry. And then enjoy. ...so neither should your food. Color is good, just ask mother nature1 (or that neighborhood yuppie hiding purple Argyle socks under gray dress pants). Its too easy to fall into the trap of serving boring, dull food. Your favorite pasta and cream sauce with garlic bread - all tan. Your best rice with sauteed chicken - tan again. Maybe its dull-colored stir fry, or burnt steak with black beans (hopefully not), or Cheerios and milk (hopefully yes). But follow nature's lead. People are attracted to bright flowers, bold sunsets, and turquoise seas against yellow Coronas with green limes. Subconsciously, your food will look attractive. Next time you're putting your meal together, think about color....and it can be simple. For that pasta dish, add a yellow lemon wedge or have a side of fresh greens. 1 You shouldn't worry that bright colors in nature often mean danger. Let me just roll with this analogy okay? Don't rush in the kitchen - It'll make her nervous. Make you look unsettled. And your awesome, ultra sharp, 8" chefs knife isn't so awesome when you slice your finger - much less if your newly appointed, sous chef cuts her finger. She's already semi-nervous about trying to cut the onions to "your standards" (quartered and diced can be equivalent sometimes). She's worried about just coming over in general and hoping that you won't serve her undercooked chicken - so don't rush her with your ultra sharp knife 2. Watch your undercooked proteins (specifically pork and chicken) - I never worry about undercooking beef or seafood. Rare is a standard temperature at the steakhouse and raw sushi is the new trend. Both have been served raw. As long as the meat or seafood is FRESH, you can get away with undercooking it. Pork and chicken are no where near this category. Buy a digital meat thermometer, look up cook times online, and be sure to check for an opaque, white center. I'm not underselling chicken or pork (I would never say such things about bacon) but maybe go with beef or seafood the first time around. Double check allergies - So now you're psyched to cook this freshly researched meal but in the mean time, you've forgotten that she's allergic to scallops. Digestive issues and allergies are becoming more prevalent, so just double check. Shellfish may be obvious, but I've come across dairy, gluten (wheat), and tomato allergies as well. She'll probably tell you beforehand but I can't say I didn't warn you. 1 It's always about a girl (or guy). Fights. Moving across the country. Injuries. Hospital Visits. (I could go on). In college, after getting a girl's number and playing phone tag for days, I finally saw a glimmer of hope. Details are hazy on how everything came together but I knew I had to get from Point A (playing card games and downing SoCo 100) to Point B as. quickly. as. possible (where my probably equally intoxicated girl awaited). Long story short, she came to the hospital 45 minutes after I arrived and ended up staying the night next to my hospital bed. I'm not going to over-analyze what that meant but after one more date things ended. I still blame the hospital. 2 Another option would be to give her a duller knife. Beer cracked, grill lit, and your livelihood on the line.... Magazines and TV commercials everywhere are pitting you against a carefully airbrushed, gym aficionado with perfectly straight, white teeth. His burgers and hot dogs (cooked in the back room by a Bobby Flay wannabe and glistening from Adobe Photoshop) are no match for your backyard, pre-made Costco burgers. They might be good for your boys but try something different next time you're hosting a party or grilling for a date. Filet Migon is to Skirt Steak as the MLB Allstar game is to a triple-A farm league. The filet gets all the hype. The most tender, lean cut of meat. Melting like butter in your mouth. But also highly and sometimes overpriced (like MLB Allstars) The filet can awesome but sometimes it can be over-hyped (like MLB Allstars). With its lack of marbling you'll need a "fat" (like the Home Run Derby) to keep it juicy and flavorful - (the reason you always see bacon-wrapped filets). But what about the skirt steak? The neglected option (AAA Farm players) that's thrown in the corner and plays second fiddle to the other players. Skirt steak is real easy to cook, the intense marbling makes it difficult for you to overcook, and the fat bails you out on creating a great flavor. I love cooking skirt steak. It's great for sandwiches, salads, and that classic taco night. It's a good sleeper option and every now and then it'll surprise the both of you. Put salt, pepper, and the rosemary on both sides of the steak. I usually use my hand to push it into the meat. Use your best judgement on quantities of salt and pepper (More than you would during a meal but less than to exceed her sodium intake for two weeks). Uncover for the last 2-3 minutes or so. Cooking with a cover will cook the meat faster but also will prevent the moisture from evaporating. If you want to get some nice "grill" lines and get the crust crispy, take off the lid and let the moisture evaporate. The key to good skirt steak is to remember to cut against the grain and at a 45-degree angle. You'll notice that the steak has long lines running across it. The idea is to cut against those long lines. Try cooking skirt steak steak one night and change up the garnishes and flavors based on the meal. Faijta night? Add some mexican and canjun spices.... Afternoon salad after a tennis match? Salt and pepper on a bed of baby spinach, fresh fruit and a quick homemade dijon vinaigrette dressing.